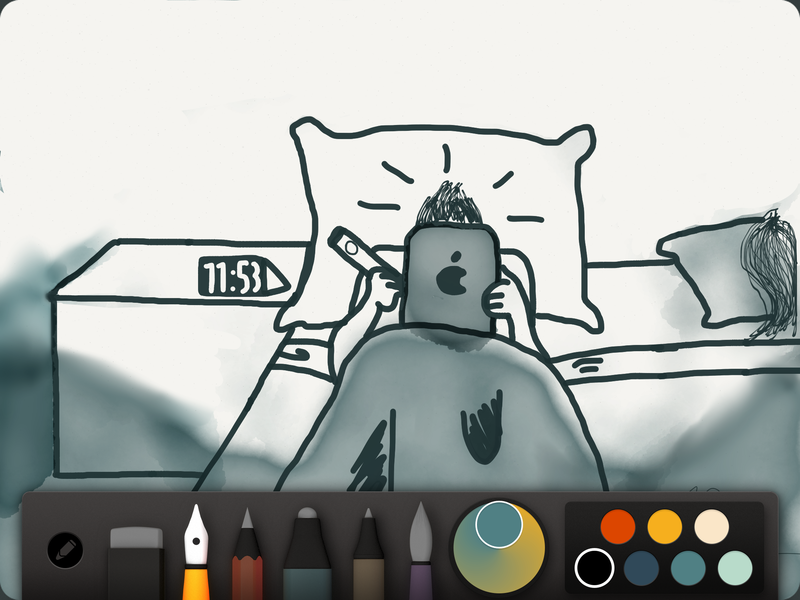 FiftyThree’s Paper app is a breakthrough drawing and handwriting tool for iPad. Upon its release in 2012, it won both Apple Design and App of the Year awards. Suddenly the potential of the iPad seemed opened up to new possibilities. The app reached a new level of utility with the recent release of FiftyThree’s first piece of hardware, the companion Bluetooth capacitive stylus Pencil. Much like Apple’s hardware and software are designed for each other, FiftyThree conceived Pencil with Paper in mind, and the results are a dream come true for anyone who has ever wished that digital drawing or writing could be more natural. The app and the stylus remarkably live up to their names. Paper is just what you would expect – a blank slate for your concepts to begin and grow. The app uses a freemium model, with an ink tool included in the initial download and additional pen, marker, watercolor, and color mixing tools available for $1.99 each. Although you can use the app without a stylus, FiftyThree recommends using one and most users prefer it that way. Pencil is the best stylus you can get. Much as Paper imitates it’s namesake, Pencil takes after an analog carpenter’s pencil. It’s shape is thin and wide, fashioned out of your choice of a weightier walnut wood or lighter aluminum. The walnut version contains magnets, allowing you to adhere it to the right side of your iPad Smart Cover or Case. Each end is covered with soft rubber concealing conductive metal, one coming to a point, used to mark the canvas, and the other flat, used to erase. Because the stylus is equipped with Bluetooth, it allows Paper to reject your palm when leaning on the screen and to sense when you’ve switched to using your finger so you can blur and blend your markings. These features require that you turn off Multitasking Gestures from the iPad Settings app, and take a few seconds to pair Pencil from within Paper. The freemium model previously mentioned effectively goes away once you have Pencil – every time you pair the stylus, all tools within the app are free for a month. These features make for an incredibly fluid work flow, more like what you’re used to with a regular pencil and paper. You’re not overwhelmed with technicalities usual to more complex creativity and productivity apps. You find yourself inscribing on the iPad just as you would on “dead wood” with a few extra benefits. A counter-clockwise two-finger rotation reverses your actions. A reverse pinch allows you to zoom in. The speed of your stroke determines thickness, instead of weight. And algorithms in the software make it possible for results to end up as intended without a lot of expertise. All this goes toward making the blank page inviting instead of intimidating. In fact, this is a stated goal of FiftyThree as a company. There are some users who would like many additional functions within Paper, and I would enjoy more ways to organize my drawings and handwriting, but I think the lack of a myriad of features is actually an advantage allowing clearer thinking. I grew up sketching and doodling, but I hadn’t drawn with a utensil for a year until I tried Pencil and Paper. I was able to pick up my hobby like I never left it. I also now feel just as inclined to make handwritten notes on my iPad as I am on paper. Pencil is also great for other actions that require precision, like photo editing, since it can be used as a capacitive stylus in any app.